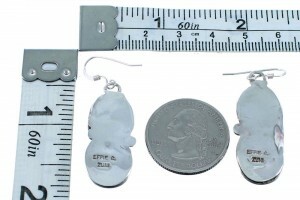 Hook dangle earrings measure approximately 1-7/8" long and 5/8" widest point. Excellent craftsmanship is shown throughout this amazing pair of earrings! 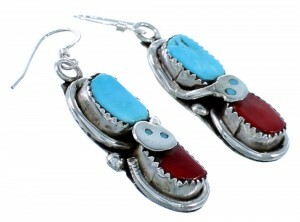 This piece of Native American jewelry is Zuni hand made by artist Effie Calavaza, out of genuine sterling silver, real Turquoise stones and Corals. The earrings have a a total of EIGHT stones, (FOUR in each earring) FOUR of which are inlayed to create the snakes' eyes, while the other FOUR are set in hand cut bezel settings, in the midst of stunning silver snake designs. Imprinted patterns and mini silver beads add style for a fabulous finish. The snake is found in many healing and fertility rituals. It is also connected with lightning, speed, and being able to move undetected. 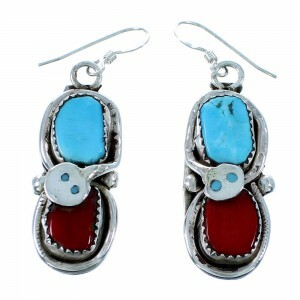 The earrings are stamped Zuni and hallmarked by the artist. 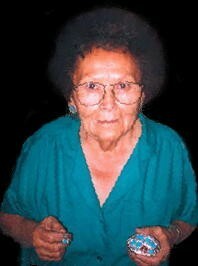 Effie Calavaza-Well-known artist Effie Calavaza is from the Zuni Tribe, which is located in New Mexico. Effie was taught by her husband Juan Calavaza and began silver work in 1956. She combined her husband's work and her designs to create some of the most beautiful and most distinctive Native American art! Her hand done work is among the best and most recognized jewelry in the southwest. Her jewelry is stamped with the family hallmark EFFIE C. ZUNI, which is used by Effie and her three daughters Georgiana Yatsattie, Gloria Jean Garcia, and Susie Calavaza. Effie's daughters assist her in the jewelry making (she shared her spouse's mark, JUAN C. ZUNI, until his death ca. 1970). To this day Effie's work is collected throughout the world and she continues making jewelry because she enjoys it!